"it's like someone took the best parts of the Alps and brought them to the sea." 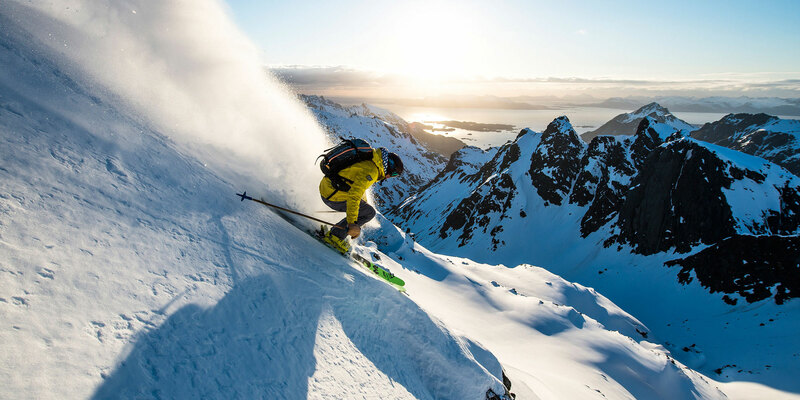 On a mission to take the most incredible freeriding photos ever made, pro skier Sven Kueenle and a team of three other guys took to the Arctic Circle, to the Norwegian Archipelago of Lofoten for twenty days. Excerpts from Sven’s diary offer illuminating insight into the story behind the photos. The following excerpts are from the second half of the journey. 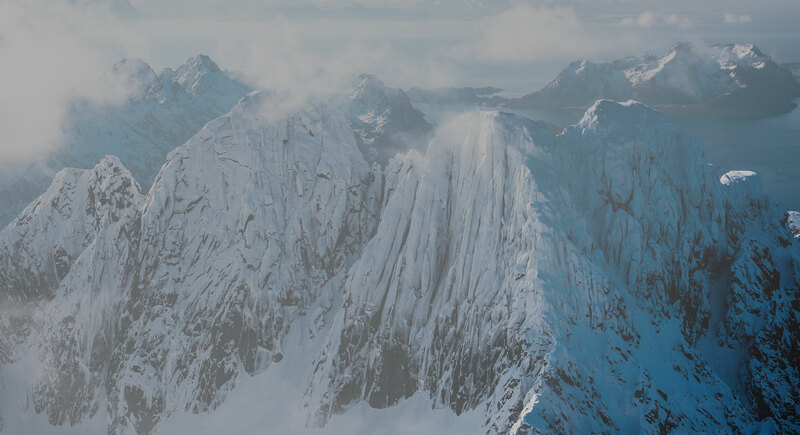 We had some good tours from our basecamp in Kabelvåg the last few days, and caught some stunning images and incredible heights despite the mountains being relatively small (around 1000 metres). Our Bogner gear has served us well. A storm rolled in today, so we only skied a little bit nearby. You barely have to pass the last house in the camp before you’re standing on a breathtaking slope – we found more than a few places with just incredible views. The guides from the Austvågøya Island came to visit us – really cool guys! Though we found out that we’re too late to see the Northern Lights – such a bummer! The closer our departure date gets, the more we try to pack into each day, leaving at 7AM and returning near midnight. This is definitely one of the best but hardest trips ever. No ski lift or helicopter to drop us off, and getting to the peak is only the start of the day’s work: Paddy Graham and I are often going up and down multiple times. The film guys are also totally beat. Even though it’s not really cold, the wind blowing in from the sea is just bitter – thankfully, our new Bogner gear kept us warm and dry. Man, we don’t want to leave anymore! Farewell, Lofoten! Our aches and bruises are healing, and everything went smoothly, thankfully. What an adventure it was! We’re bringing back some phenomenal photos, insanely sore muscles and a backlog of sleep-deprivation, but hey – when will we ever get to come back here again? The Lofoten Islands on the Norwegian coastline are just north of the Arctic Circle, and can be reached by plane, ferry or car (via the “Lofast”) year-round. The main city of Svolvær has a population of almost 4,500. Fishing is the region’s primary industry, though tourism is unsurprisingly becoming an increasingly important source of revenue. In the winter months the region affords amazing views of the Northern Lights and incredible skiing. In summer, hiking routes between the fjords, the mountains and the coasts are popular, along with the midnight sunshine, while the water is a paradise for fishermen. The Lofoten climate is relatively mild, thanks to a warm gulf-stream tail. More information is available at lofoten.info.